For the mermaid fan in your life, check out these easy and fun Mermaid Mini Cakes! Inspired by The Little Mermaid, these fun cakes make perfect treats for parties! To say that we’re mermaid obsessed in our household would be a huge understatement! 隆‍♀️We are totally in love with all the magical things here, heck yes! Recently, we made Mermaid Rice Krispies Treats and immediately brainstormed more mermaid baking fun in the kitchen. Who doesn’t want to bake a purple cake like this? I mean, IS THAT PURPLE NOT FABULOUS? We had to! The colors, the fondant, we are SO IN LOVE with these Mermaid Mini Cakes! We’ve been busy in the kitchen making magic recently, to include all things mermaids and unicorns, and this Mermaid Mini Cakes recipe is no exception! Using a homemade cake recipe along with a fool-proof homemade buttercream and ready made fondants, this fun recipe for kids is a big hit for children’s birthdays or any mermaid themed parties! Be sure to print out your The Little Mermaid Coloring Pages and Activity Sheets to go along with it! We made this recipe easy enough to involve your little ones in the baking process! Some of my fondest memories of being a kid was being in the kitchen with my mom making confectionaries alongside her. Back then, she’d lend me one of her aprons to use, and I’d end up with flour in places I never intended and she’d even let me lick the spoon! 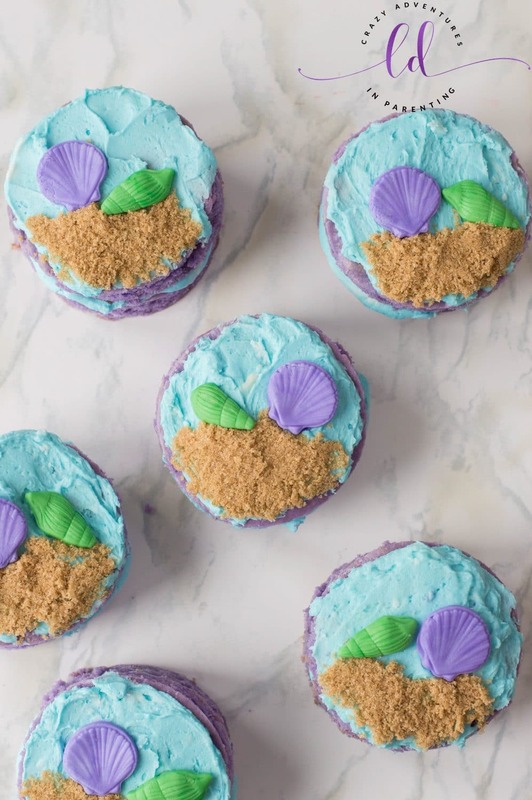 Memories like that last a lifetime, I hope you’ll consider getting in the kitchen with your littles with this easy Mermaid Mini Cakes recipe and bake up some lifelong memories of your own! Our homemade buttercream frosting is super simple to make and always called upon in recipes like just like this! Tried and true and always comes out perfectly every time, what more can you ask for? Just blend a few ingredients together with a mixer and you’ve got a perfect frosting recipe to decorate with again and again for anything your heart desires! And this homemade frosting recipe is absolutely perfect for this Mermaid Mini Cakes recipe! Adds the perfect bit of sweetness and dyes so beautifully, can you believe how gorgeous those colors are? Imagine serving these colorful Mermaid Mini Cakes at your child’s next party or get together! These fun cakes would be fun for a tea party or to serve instead of cupcakes at a birthday party, the possibilities are endless! 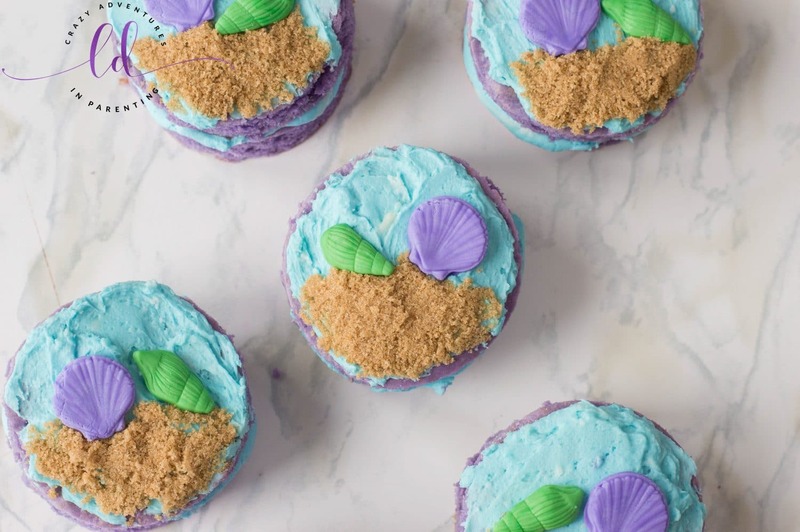 The brown sugar acts like “sand” on these mini cakes and just adds that additional something special to really sell the mermaid theme, don’t you think? Colorful confectionaries like these make me smile! The fun mermaid colors make these mini cakes a fun treat for children and for mermaid themed parties! There’s something positively magical when you use gel food coloring via the regular food coloring! The colors are brighter, the gel food coloring blends into your dough or frosting easier, and I think you get an overall better final product as a result, don’t you? I mean, look at these colors! Gather the kids for this one! They’re going to love using the circle cookie cutter to cut out cake circles for these Mermaid Mini Cakes! Let them help you create the fondant seashell shapes too with the seashell fondant mold. Creating with fondant is just like creating with clay, only edible! With all the colors and shapes, this recipe is perfect for the kids! To make the cake, line a rectangular baking sheet with parchment paper (or reusable silicone baking mat) and set aside. Preheat oven to 350 degrees F. In a small bowl, use a sifter to sift together flour, baking powder and salt. Using an electric mixer in a larger bowl, beat eggs, sugar, vanilla extract, and canola oil. In thirds, slowly add dry ingredients into large bowl of wet ingredients, alternating with the milk. Once batter is formed, add purple gel food coloring and mix until completely tinted. Pour batter onto lined baking sheet and even it out with a spatula. Bake for about 15-20 minutes. Allow to cool and once cooled, cut out twelve circles using your circle cookie cutter. To decorate the mini cakes, start by making the buttercream by mixing together butter, icing sugar, and milk. Once buttercream starts to take form (creamy and forms semi-stiff peaks), add blue food coloring. Mix until tinted. Scoop 2/3 of your buttercream into a piping bag and frost six of your circular mini cakes. Add an unfrosted circular mini cake on top. Using an offset spatula, frost the top of each cake. Add brown sugar to act as “sand” on top of each cake. Using your fondant mold, create seashells with your fondant. To achieve a perfect seashell mold, take a small portion of fondant and press it evenly into your desired shape. Pop out and place two on top of each cake. Full recipe with measurements is below for you! If you love this recipe, check out our other mermaid and unicorn recipes along with our magical crafts! I hope you enjoy making this recipe as much as we do! Line a rectangular baking sheet with parchment paper (or a reusable silicone baking mat) and set aside. Preheat oven to 350 degrees F.
In a small bowl, use a sifter to sift together flour, baking powder and salt. In a larger bowl, using an electric mixer, beat eggs, sugar, vanilla extract, and canola oil. In thirds, slowly add dry ingredients into large bowl of wet ingredients, alternating with the milk. Once batter is formed, add purple gel food coloring and mix until completely tinted. Pour batter onto lined baking sheet and even it out with a spatula. Allow to cool and once cooled, cut out 12 circles using your circle cookie cutter. Make buttercream by mixing together butter, icing sugar and milk. Once buttercream starts to take form (creamy and forms semi-stiff peaks), add blue food coloring. Mix until tinted. Scoop 2/3 of your buttercream into a piping bag and frost 6 of your circular mini cakes. Add an unfrosted circular mini cake on top. Using your fondant mold, create seashells with your purple and green fondant. To achieve a perfect seashell mold, take a small portion of your fondant and press it evenly into your desired shape. Pop out and place two on top of each cake.